This is Part 1 in a 3-Part Series on inspiring your daughter. Young girls swoon today over the music, looks, and happenings of the popular British Boy Band One Direction. But what if I told you that you could compete for that kind of influence in your daughter's life. Although you, as her mom, start out as the single, most influential voice in your daughter's life, that may change the day she decides to look elsewhere for a role model. Friends, boyfriends, celebrities and musical artists all compete for her heart, mind and values. So I want to encourage you with some ways to remain (or reclaim) an inspiration in her life through some deliberate and intentional actions on your part. After surveying daughters aged 15-45 as I was writing my book, When a Mom Inspires Her Daughter, I learned a lot about what girls need most from their moms. And three things stood out that, if practiced, can do wonders to build your relationship with your daughter, rather than break it. Here are three ways that you can be the one person your daughter looks to, over anyone else, for advice, approval, encouragement and inspiration throughout her growing up years and beyond. A - Accept Her for Who She Is. This sounds like a no-brainer. But you'd be surprised how many daughters I've talked with who truly believe they can never measure up to their moms' standards. In fact, not feeling accepted by her mother was the most common wound I encountered as I interviewed young women to talk about their relationship with their moms. Daughters need to know they are loved for who they are, not what they do. It's one of the ways we show them the unconditional love of Christ. In most cases where daughters carried a wound of not feeling accepted, their moms were unaware their daughters saw them as critical and unsupportive. If you tend to be a critical person, or somewhat of a perfectionist, your daughter may see that as a lack of love or support for her. Critical words can easily slip out of our mouths when we talk to our daughters. Through the years, I've found that Ephesians 4:29 is an excellent safeguard for how to talk to our daughters: "Do not let any unwholesome talk come out of your mouths, but only what is helpful for building others up according to their needs, that it may benefit those who listen." A girl's deep need for acceptance is often at the heart of every choice she makes concerning friends, boyfriends, activities, and where and how she spends her time. Knowing she is deeply loved and accepted for who she is will cause her to set her standards higher when it comes to relationships, rather than making decisions so she'll "fit in" or "feel loved." You can show acceptance to your daughter by supporting her dreams and ambitions even if they are different from yours. You can also show your love and support by understanding and accepting the ways she is different from you. For example, you may be tidy and neat, she might not. You may be an early riser, she might be a night owl. You may have excelled academically, she might be more interested in art or music. Give her leeway to be herself and appreciate and affirm the ways she is unlike you, because those things make her unique. Our girls will want to be around others who "get" them. Why do you think they are so attracted to musical artists their age and celebrities who talk about what they are interested in? They long to connect with someone at an emotional level and when a celebrity or singer says something they are thinking or feeling, they make the emotional connection. We can better understand our daughters by asking them questions and listening to them or, better yet, listening to what they are listening to. Another way to enter your daughter's world and be an encouraging observer there is to "friend" her on Facebook (if she's old enough to have an account) and be an encouraging observer. Sometimes it's better if we just verbally and positively comment on their posts, rather than write something that would embarrass them in front of their friends. Another way to enter her world is to take her to movies she is interested in and offer to bring one or two of her friends along. Or, become involved in what she is interested in by being the driver (if she can't yet drive) or the greeter (who meets her at the door to share in the excitement of what she has just experienced). Be creative and find a way to take an interest in what she's interested in...even if it is not something you would've liked when you were her age. Our daughters will want to be around people who make them feel good about themselves. So that's where you and I, as mothers, need to be doing all we can to build them up, not tear them down. My daughter recently told me "If you're ever having a bad day, Mom, just watch a One Direction music video. They'll make you happy." Now why does she believe that? Because those boys sing things like "Don't need make up to cover up. Being the way that you are is enough" and "You don't know you're beautiful." When I realized the power of encouraging words on my daughter, I began to use them more often when talking to her. That caused her to listen more, rather than shrink away. Our daughters are hard-wired to want to please their mothers and make them proud. That's why it's important that you and I, as moms, affirm their efforts, but also let them know that it's okay to not have to look perfect or excel at everything. Your daughter may still be struggling to figure out what it is she does well and what she wants to pursue in life. Give her time. Allow her to fail. And be her cheerleader every step of the way. She will want you around if you praise her more than you point out what she's doing wrong. Cindi McMenamin is a national women's conference and retreat speaker and the author of a dozen books, including When Women Walk Alone (more than 100,000 copies sold), When a Woman inspires Her Husband, and When a Mom Inspires Her Daughter, upon which this article is based. For more on her books and ministry, or to download her free article "Suggestions for Mother-Daughter Memory-Making" see her website: StrengthForTheSoul.com. Beautiful and amazing story of letting God control your life, against all odds. keeping your faith, hope and eyes on Him for guidance in all things, no matter how fearful you might be or how unexpected life might become. This was am amazing, uplifting story or love and sacrifice. Beautifully told, you will not be able to put this book down. I laughed, cried and my heart was overfilled. The faithfulness to God of this family is inspiring. Dabey's willingness to continue to serve God through all her trials is what the true christian walk should like like. Yes, we get beaten down, yes, we don't understand why always, but what we do know is that God is perfect and He has our best interest at heart so we follow gladly, filled with the power of the spirit and that is exactly what Dabey did. While reading this phenomenal book I found myself asking " How is God transforming my heart? I am I listening and walking in obedience to His will above my own?" I would highly recommend this book to anyone struggling with the circumstances in thier life and needing a reminder that we are not in control-God is. The sooner we learn to lean on Him through our trials, the more fulfilling our lives will be. Disclaimer: I received a copy of this book free from Tyndale Publishing via Net Gallery in exchange for my honest opinion and review. My opinion no way reflects those of Tyndale or Net Gallery. From the internationally bestselling author of Lessons in Laughing Out Loud comes a moving and heartwarming novel about a woman who escapes an abusive relationship and flees with her young daughter in search of a kind stranger she met many years earlier. Remembering the letter that says, “You are a remarkable woman and you deserve all the happiness, contentment, and love in the world. I, for one, know that I have never met anyone quite like you,” Rose Pritchard turns up on the doorstep of a B&B in England’s lake district. It is her last resort, as she and her seven-year-old daughter Maddie have left everything behind. They have come to the village of Millthwaite in search of the person who once offered Rose hope. My review: I heard it said once that “love is blind, but marriage is a real eye opener.” How true this is in so many cases. This book captured the essence of the defeat you can feel when your self worth is carefully picked away till almost nothing remains. This is a wonderfully wrote story of redemption, power and overcoming physical and emotional abuse. Webster defines commitment as “to give in trust, custody or consignment, a pledge or promise.” The pledge or promise we make in marriage is the biggest commitment we ever make, yet all too often it is abused and neglected, left rotting. In a last ditch effort Rose decides to make a run for it before its too late. With the help of some great friends Rose meets along the way she is able to overcome her worst fears and begin to heal. But, there is a story with the story here as well. Not only is this book about Rose and her journey, but it is also about her daughter. Too often the kids become the neglected one when a marriage goes south. We try to hide things from them and we think we are sheltering them, but kids are very perceptive and know a lot more then they let on. Sadly, they do not know how to process what is happening in the world around them and they self internalize the conflict as in the case with Maddie. I loved watching this little girl come to terms with what was taking place and seeing her open up and learn to live and love once the dysfunction was done away with. Just a very beautiful, heartbreaking story. Should we try to alter the systems among which we find ourselves? Should we even judge them?I kept finding myself going back to these questions. I'll let you judge for yourself. Rowan Coleman worked in bookselling and publishing for seven years during which time she won the Company magazine Young Writer of the Year award. She is the author of Runaway Wife, The Accidental Mother, Another Mother’s Life, Mommy By Mistake, The Accidental Family, The Home for Broken Hearts, and Lessons in Laughing Out Loud. She lives with her husband, daughter, and sons in England. Disclaimer: I received a free copy of this book from Simon and Schuster in exchange for my honest opinion. The views expressed are my own and in no way reflect those of the author or publishing company. You know you're supposed to like him, but you just don't. Maybe it's the authoritarianism, maybe it's the arrogance, maybe it's the views he seems to hold, maybe it's the way that he drones on and on until you're falling asleep. Well ... you're not the only one. None of that is new. Not even the last bit (see Acts 20:9). But there's a secret to liking an initially unlikeable person like Paul: walk a mile in his moccasins. Or three. 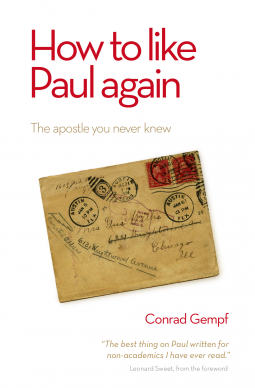 This small book aims to take you inside three controversies that Paul faced. Would you have advised him to do anything differently? Would you have done as well as he did? This is a quick and entertaining introduction to the letters of Paul, from which you'll also learn about yourself. This was a quick, fun read that guided me through the works of Paul in the New Testament. Gempf covers the books of Galatians, Corinthians, and Philemon and uses the Book of Acts to begin our understanding of Paul. Paul is one of those guys you love to hate and hate to love. He reminds you of yourself is the problem.He comes across as self assured, haughty and at the same time gentle and compassionate. He is a tough guy to get your head and heart around. I always wonder what his crutch in life was that he struggled with, but nevertheless Paul is real. He lives life on Gods terms and makes no excuse for the gospel or his love of it. I really adore books that have a great discussion guide or questions to help really dig into the topic and I was not let down. The discussion questions were tough and really made you sit and think before you could respond to them. Parts of the book were entertaining and made you chuckle and parts really engaged you and made you evaluate your own life. I think most people seem to forget that although they allow us to take a glimpse into the days and times of Paul and the happenings and events that surrounded his life these "books" are actually letters wrote to elaborate on a specific issue that the people/church were facing. Since I am a home educator I am always searching for books that we can use as part of our biblical studies. My older children (18, 16) were able to follow along pretty well on their own and engage in the discussion questions, but my younger two (13,6) really needed more guidance and explanation into the reading and study questions. This being said, I would highly recommend this book to use in a church setting as a bible study, or in an education setting with high school students. A young Confederate soldier is given a journal as he departs for war in 1861. The little book soon falls into the hands of another and another and another. The journal travels all through the war, crossing battle lines several times and presenting thoughts from both sides of the war. Each soldier who writes in the journal is in a different situation and each is in a different place in his relationship with God. The words that others have written in the journal have an effect on those who acquire possession of the book later, and the journal becomes quite important to each soldier. A native Texan, Beth Harlow and her husband, Gale, live in Franklin, Tennessee, where one of the bloodiest battles of the Civil War was fought. They have three children and are members of Brentwood Church of Christ in Brentwood, Tennessee. Beth spends as much time as she can with her four grandchildren–Claudia, Lukas, Zachary, and Tegan–and spends the rest of her time painting, gardening, reading, and writing. 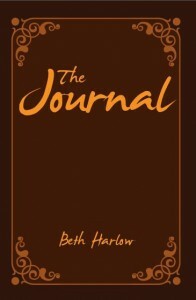 The Journal is her first novel. Favorite Quote: " What are you trying to kill me?" This was in regards to some rides at Six Flags we wanted you to go on, or more accurately that Sarah wanted you to go on with her. You do not do roller coasters. What has impressed me most about you this month: This month is a little hard to do since I am around you so little. I guess I would have to say how you make your little brother smile. You were very nice to him on the few occasions we saw you which meant the world to him. He misses you very much when you are gone and when you get home he wants nothing more than your time and approval. So the fact that you gave that to him, which is becoming rare, really impressed me. John 15:18-25 "18 “If the world hates you, you know that it hated Me before it hated you. 19 If you were of the world, the world would love its own. Yet because you are not of the world, but I chose you out of the world, therefore the world hates you. 20 Remember the word that I said to you, ‘A servant is not greater than his master.’ If they persecuted Me, they will also persecute you. If they kept My word, they will keep yours also. 21 But all these things they will do to you for My name’s sake, because they do not know Him who sent Me. 22 If I had not come and spoken to them, they would have no sin, but now they have no excuse for their sin. 23 He who hates Me hates My Father also. 24 If I had not done among them the works which no one else did, they would have no sin; but now they have seen and also hated both Me and My Father. 25 But this happened that the word might be fulfilled which is written in their law, ‘They hated Me without a cause.’[a]"
Where I hope to see you grow: I feel you are trying to grow away from God in some very important areas of your life. You do not like what the Bible says about them or how you are suppose to respond and you are getting increasingly more hostile to the word of God. Alot of this revolves around making wise decisions when it comes to what you listen to , watch and what comes out of your mouth. You also are struggling with scripture and homosexuality. You have friends that are gay/bi and know people you are friends with that have relatives that are gay/bi and it makes you incredibly angry when they ask me about this topic and I simply refer back to God and His word and that I do not condone nor accept it. I love your friends, some of them I have known since they were in Kinder, but the lifestyle choice I do not accept or approve of and it makes you very angry. I know these are hard times for you as you struggle with who you are in Christ and how that will set you apart from the world I cna only hope that I gently guide you down the correct path and teach you to dig into the word of God for your answers and not just peoples opinion on topics that hit very close to your heart. Well since this is the month you are always gone the list here comes up short sometimes. 1. Roller Skating: Although I don't like the stinky dances they do (raunchy), I do like watching you skate around, smiling and enjoying life. You look so care free and relaxed it just nice to see you that way. Your not trying to impress anyone or be anything other than who you are. Your just there having fun, singing along to the songs and sadly dancing to some of them as well. Although I still think you do this to annoy me more than anything. 2. 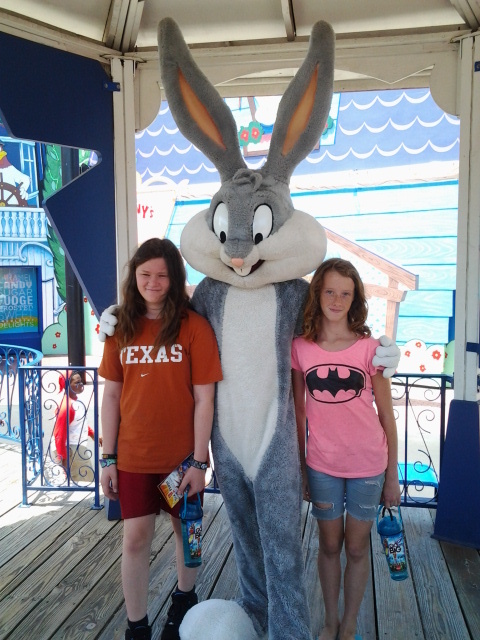 Six Flags: Once again we celebrated your cousins birthday at Six Flags. I think we are starting a tradition here, 3 years in a row now. I love getting to take you here, even though you like to ride the swings. 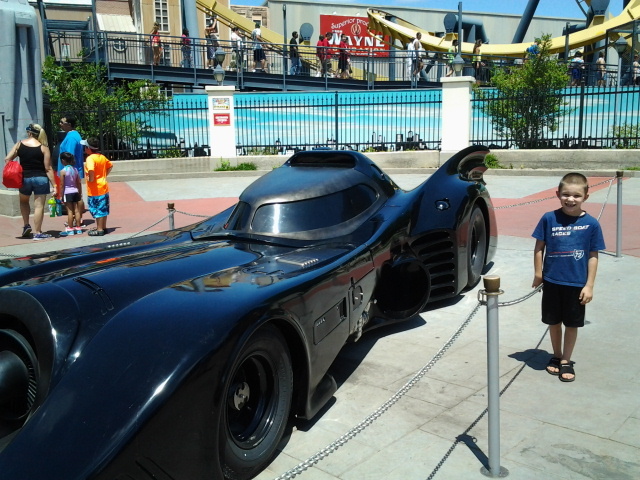 ;) We do the water rides, the small coasters, some games, and just talk and walk around people watching and being silly. Its nice to just talk and see you in your element, bonding with family. I think this is the one place we go that no one fights and you all compromise and get along! Maybe we should move in? 3.Bone Marrow Drive: We went to support the American Heritage Girls and Drake went to support the Boys Scouts for a little boy in Drake's troop whose brother has Leukemia. 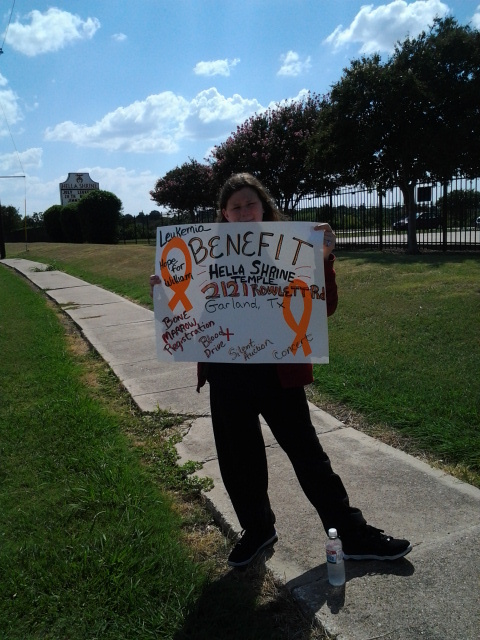 We volunteered for about 3 hours and tried to gain support to help raise funds for medical expenses and also to help find a donor for William. We spent a lot of time on the street waiving signs around and inside we bid on the raffles and you actually won. Of course, you bid on the cupcakes and one 2 dozen, one you took with you and you got a coupon for the other 12. You were elated, me not so much. I think it was good for you to be able to put a face to this disease for it to really hit home with you. Favorite Quote: " I can ride it." You wanted so bad to ride the Super Man, the new swings and every other roller coaster in the park. It was adorable. What has impressed me most about you this month: How grown up you are becoming. 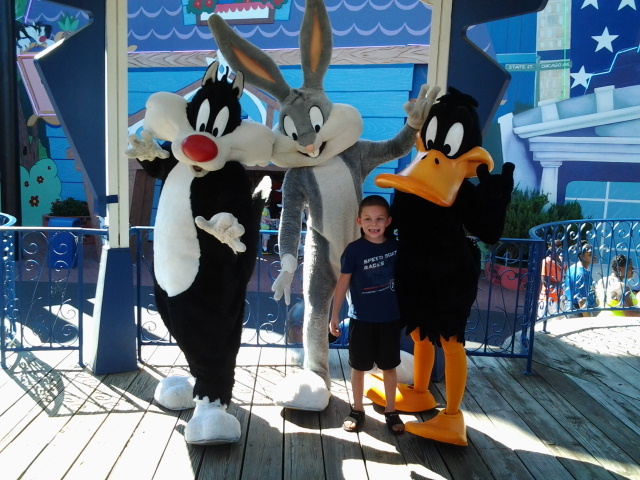 My little man has lost 3 teeth, riding his bike, getting himself dressed without complaining, and riding roller coasters! Slow down. There is not rush to grow up buddy. Yet, you still have this very kind and sweet heart towards others. You have a love for the Lord that amazes me and you pray like you and Jesus are best o buds hanging out talking. Its actually inspiring to me. "Those who love your law are completely secure; nothing causes them to stumble"
I picked this verse for you because of your love for the word of God. You are constantly asking me questions about what the Bible says or questions that make me dig in the word for answers. I stand amazed at how much you desire to know truth and were you know to get it! Where I hope to see you grow: Your ability to get along with your sister for more than 30 minutes! The house is calm and quite till you to get together then BAM! chaos. It never ceases to amaze me how you can have such a devoted love for your sister when you 2 fight so much. Yet when she is gone you cry for her, pray for her, call her and cannot wait for her to get back. Then 20 minutes later you guys are at each others throats. I hope to see you both grow in respecting each others boundaries and listening to one another. You both lack greatly in this area, but just with one another. 1. Rangers Game: About 70 people from our church all went to the Rangers game this month against the Baltimore Oriels. We lost, but that was ok. You had your buddies up there (Logan, Jessy, AJ, Aubrey) and you had a blast talking with them about the game, playing with pillow cases on your heads, did I mention it was pillowcase night? You hammed it up and had a great time. Ate nachos, lemon chills and drake soda and stayed up way past your bedtime. It was a great night, with just me and my little man. 2. Six Flags: You rode every ride you were tall enough to ride with your hands in the air the whole time. You had the time of your life. You were so brave it amazed me. You rode rides that went backwards, sideways and even rode the Conquistador ship with your hands in the air and a smile on your face! I was blown away. Last year you would not ride half of those rides and this year you went with no fear at all. I fear I have an adrenaline junky on my hands. 3. Roller Blades: Oh yes, you got your first pair of roller blades and you have been in them non stop. Inside the house, outside the house, you simply don't care as long as you are skating. You are getting pretty good on them too. I find it funny that you have a hard time at all on them since you can ice skate and roller skate, but hey to each their own. Your having fun, getting some exercise and its fun to just sit back and watch you or walk along beside you as you hold onto me. I am not a big romance junky and don’t normally enjoy books like this, but I have to say I was pleasantly surprised when I read this book. It was not overdone in romantic details, but more implied (sometimes lacking in real emotion though) which made the book in my opinion. I loved the theme of forgiveness, not being judgmental and seeking yourself and worth within God. I am pretty familiar with the story of Hosea and how that marriage represented Israel’s betrayal of God so it was hard to not think of that story when reading this book. I think the author did a wonderful job of modernizing that story in a different light without coming across as judgmental. Her characters are well developed and relatable which draws you into the story. The way she brings Michael and Angel together shows the real conflict of letting go of your past and embracing and accepting someone else’s past for the sake of love. This story reminded me so much of Gods unfailing love, grace and forgiveness. It was easy to get frustrated with the Angel character, but how many times have I been the same way? How wonderful it is that I know I have a Savior and Redeemer always willing to welcome me back into His arms and forgive me time and again. "New York Times" best-selling author Francine Rivers began her literary career at the University of Nevada, Reno, where she graduated with a bachelor of arts degree in English and journalism. From 1976 to 1985, she had a successful writing career in the general market, and her books were highly acclaimed by readers and reviewers. Although raised in a religious home, Francine did not truly encounter Christ until later in life, when she was already a wife, a mother of three, and an established romance novelist. 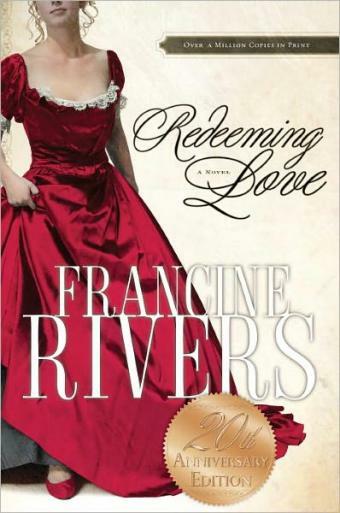 Shortly after becoming a born-again Christian in 1986, Francine wrote "Redeeming Love" as her statement of faith. First published by Bantam Books and then rereleased by Multnomah Publishers in the mid-1990s, this retelling of the biblical story of Gomer and Hosea, set during the time of the California Gold Rush, is now considered by many to be a classic work of Christian fiction. Redeeming Love continues to be one of the CBA's top-selling titles, and it has held a spot on the Christian best-seller list for nearly a decade. Since "Redeeming Love," Francine has published numerous novels with Christian themes--all best sellers--and she has continued to win both industry acclaim and reader loyalty around the globe. Her Christian novels have been awarded or nominated for numerous honors, including the RITA Award, the Christy Award, the ECPA Gold Medallion, and the Holt Medallion in Honor of Outstanding Literary Talent. In 1997, after winning her third RITA Award for inspirational fiction, Francine was inducted into the Romance Writers of America's Hall of Fame. Francine's novels have been translated into over 20 different languages, and she enjoys best-seller status in many foreign countries, including Germany, the Netherlands, and South Africa. Francine and her husband, Rick, live in northern California and enjoy time spent with their three grown children and taking every opportunity to spoil their grandchildren. Francine uses her writing to draw closer to the Lord, and she desires that through her work she might worship and praise Jesus for all He has done and is doing in her life. 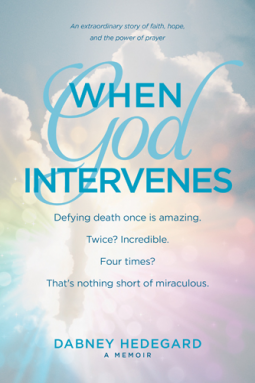 Disclaimer: "I received this book for free from WaterBrook Multnomah Publishing Group for this review." Then there was the spiked hair–the shade of which changed monthly–“colorful” language that can’t be found in your everyday sixteen-count crayon box, a pack-a-day habit, less-than-modest wardrobe, and an obsession with guitar-trashing, drum-bashing music. Did I mention I’m also a preacher’s kid? That’s right. And like the prodigal son after whom I modeled myself, I finally saw the error of my ways and returned to the fold. Today my life is all about “lead me not into temptation.” When I’m not serving as Women’s Ministry Director at my father’s church, I’m working at Gloria’s Morning Café. I even have worthy goals, like saving enough money to buy the café, keep my Jelly Belly habit under control, and to never again hurt the people I love. No more parties. No more unsavory activities. And no more motorcycles! You’d think I was finally on the right track. But since my dad’s replacement hired a hotshot church consultant to revive our “dying” church, things aren’t working out as planned. And now this “consultant” says I’m in need of a little reviving myself. Just who does this Maddox McCray think he is anyway? With his curly hair that could use a good clipping, tattoo that he makes no attempt to hide, and black leather pants, the man is downright dangerous. In fact, all that’s missing is a motorcycle. Or so I thought… But if he thinks he’s going to take me for a ride on that 1298cc machine of his, he can think again. Harriet Bisset is a reformed woman, and she’s going to stay that way. Even if it kills me! The first book I read by Tamara was Perfecting Kate and I was an instant fan. She has this very witty, sarcastic sense of humor that captivates you and draws you into the story. Her characters are so well developed that you know you know someone just like them and you can relate to the story. Tamara took the touchy issue of church politics and weaved it into a funny, dynamic story that had you laughing and shaking your head all the way through. I adored the awkwardness between Maddox and Harri. How everything about Maddox made Harri want to get to know him and push him away at the same time out of fear of backsliding. Harri reminds me a little of myself, but you cannot forget how marvelous Gods grace and forgiveness truly is. This is a fabulous story of love, redemption, real forgiveness and letting go of the past and embracing where God has you know weaved together with trusting your church elders to have the best interest of all involved when making changes, even when you cannot see them at the moment. This is a simple, light hearted, fun book to read with a great message intertwined that I would highly recommend. Tamara Leigh is the bestselling author of Perfecting Kate and Stealing Adda. Her first seven novels earned awards and became national bestsellers, but Tamara was dissatisfied that the stories were not God-honoring. In 2003 she determined to write books that more directly represented her faith. Tamara and her husband, David, live with their two young sons in Tennessee.